All procedures provided at the Shaw Center are performed in a customized, professional and innovative office environment. 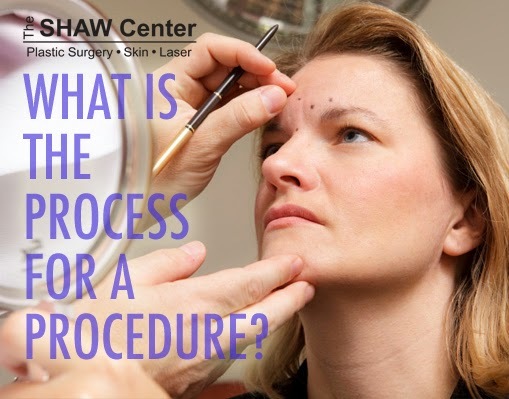 There are a few steps that a patient experiences in order to receive a procedure. These steps include a consultation, pre-surgical preparation, surgery and post-surgical care that are all provided in a skillful and attentive manner. Prior to any cosmetic procedure a consultation with Dr. Shaw is done for a small fee, all spa consultations are complimentary. Consultations give patients sufficient time with Dr. Shaw and his staff for an in-depth evaluation based on the patient’s concerns. Understanding the patient’s goals, determining what is best for the patient, and educating the patient about the procedure and recovery are the primary focal points of the consultation. Any and all questions the patient has will be thoroughly answered throughout the consultation as well. A preoperative preparation presents in-depth tailored instruction, photography and a detailed discussion with Dr. Shaw and the staff. All procedures aside from treatments in the spa are performed in Hospital based and fully accredited Outpatient Ambulatory Surgical Facilities. The majority of the procedures are done using general anesthesia. In order to strengthen safety and reduce risk, a board-certified anesthesiologist administers the anesthesia and monitors you during the procedure. All post surgical care is fulfilled through an outpatient bases or inpatient at the Piper Ambulatory Surgery Center. Our staff will contact you in person or by phone and are available for any issues, questions or concerns 24/7. If you are unable to make an appointment, please contact us with at least 24 hours advanced notice in order for us to give your appointment to another patient if possible. The Shaw Center accepts the following forms of payment: Visa, MasterCard, American Express, Cashier’s check, money order or personal check. We also accept patient financing through Care Credit. If you are interested in scheduling a consultation or would like more information, call the Shaw Center at (480) 767-1900.